Have you ever been stressed, ill or run-down only to notice that you get a rash all over your skin? This is what is known as either hives or a stress rash. Let’s look at what a stress rash is, where it comes from, whether it’s a problem and what to do about it. Do You Have a Stress Rash? The term stress rash does not really refer to any one issue but is actually more of an umbrella term for various different types of rash. Stress rashes can vary in severity and can have numerous different causes. Generally, stress rashes will be a form of urticaria and urticaria itself can have numerous other causes – so it’s usually a good idea to check with your doctor before writing your rash off as a stress rash. Other causes of urticarial include allergic reactions and illnesses. How Does Stress Cause Rashes? Unfortunately the explanation for how stress rashes are caused is not entirely clear cut. Stress is well known to affect the body’s immune system, which happens because the body redirects blood and oxygen away from ‘background processes’ like immunity and towards your muscles and brain. The idea of the stress response is to provide our brain and oxygen with more fuel so that we can escape danger – in the wild it was never designed to go on for long periods of time and we have not yet evolved enough to be selective in our stress responses. During the stress response then, the body’s immune defenses are lowered and this can often result in underlying conditions coming to the fore. This is one reason that it’s common to have a ‘breakout’ if you have a condition like herpes if you get stressed. At the same time, it could also be possible that the body considers stress itself as an allergen. In this case, the body could react to stress in the same way as someone else might respond to pollen or dander. 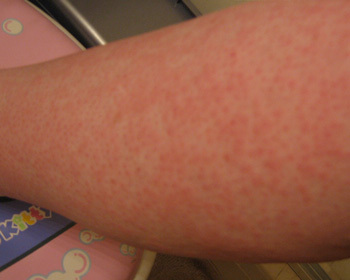 Here, the body begins to produce more histamine, thus resulting in inflammation and what appears to be a stress sign. The most obvious signs of a stress rash are slightly raised skin, redness and itchiness – as with any other allergic rash. This might cover the body in small amounts such as the arms, legs, torso or neck. What Causes a Stress Rash? You might now be wondering why some people are susceptible to stress rashes and other are not. Here the explanation could be the same as for any other allergic response. Currently the leading explanation for how we develop allergies is that we become ill or respond to a toxin at the same time as experiencing something else – in this case stress. For instance then, if you were to become very stressed at the same time as fighting off an infection, your body could end up making an incorrect association and assuming that the stress was the toxin/infection that made you ill. From then on, it would treat the hormones associated with stress as though they were toxins and cause an allergic reaction. This explanation for stress rashes is actually only a theory however and there are problems with it. The only way we could be allergic to stress would be by being allergic to the actual hormones involved in the stress response. As we will often experience these same hormones even when not stressed, this would make it unlikely that only severe stress would trigger a reaction. In theory a waterslide could cause a stress rash if it was caused by adrenaline alone. Regardless of the cause, treating a stress rash will normally involve avoiding stress and trying to calm down. The objective here is to get the immune system back to full function so you want to not only avoid stress but also try to promote generally good health and high energy. That means eating nutritious foods high in vitamin C and antioxidants which are known to be good for the immune system and it also means getting plenty of sleep. If you have something of a stressed personality and find yourself regularly struggling with the symptoms of stress, then it can be a good idea to try to teach yourself coping strategies to deal with the onset of stress. These include such precautions as learning breathing techniques and using cognitive restructuring to change the way you think about stressful events in your life. Seeing a cognitive behavioral therapist could be helpful. Meanwhile, you can manage the symptoms of a stress rash with a soothing cream or potentially a topical corticosteroid cream which could help to reduce inflammation. You could even try a non-drowsy antihistamine. Ultimately though, sleep and R&R will be the best medicine for most cases of stress rash.